FairyFiligree is officially back after a 3-month 'sabbatical'. I needed the break. The lack of feedback and response from followers had been getting me down but when I disappeared from the scene I repeatedly go the same question - why have you given it up? So many people encouraged me to take up this blog again that I decided to come back and start sharing beautiful stuff with you all once more. So much has been going on. At the moment I am curating a collective exhibition of 63 artists here on the Mediterranean island where I live. The exhibition is welcoming 63 different works - one work from each artist and includes paintings, sculptures, mixed media artwork, jewellery..... This is the second of a series of exhibitons which I hold on an annual basis - the scope is to encourage new artists to exhibit their work alongside that of seasoned artists. All work is very low to moderately priced and this is an added challenge to artists - to produce art that does not cost a bomb to produce, but which is still exciting for somebody to take back home or to give away as a gift. What do you think of the poster I am featuring with this post - incidentally my first post for 2011? 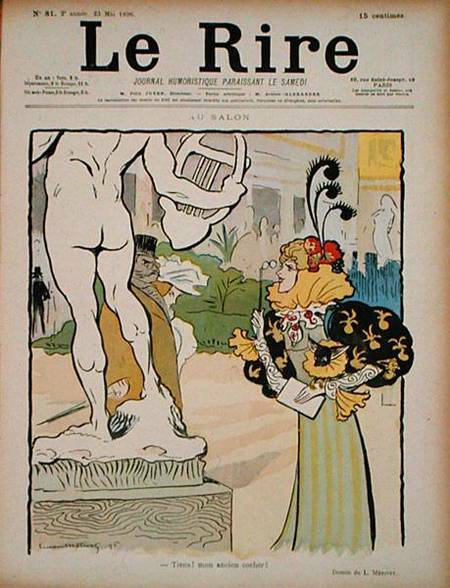 It shows a front cover of the celebrated Parisian magazine called 'Le Rire', meaning laughter in French. The magazine was a humour magazine, much sought and therefore extremely successful between 1894 and the 1950s. The satire on this magazine was backed by drawings from some of the best artists of the era - Henri de Toulouse-Lautrec, one of my favourite artists is one of them.